This year there are many inventive and exciting ways to celebrate Halloween on the North Fork, and a stay at North Fork Bed and Breakfast Association member inn would make it one of the most memorable Halloween weekends you’ve ever had. On Friday, Oct. 30, the 250 year-year-old Hallockville Museum Farm in Aquebogue will have a 50-minute Haunted Museum Tour. Storytellers will take visitors on a spooky ride and recite stories like the tale of the phantom officer and the spectral bride. The stories will be based on historical occurrences, local folklore and urban legend. Admission is $7 per person. Tour begins at 4:30 and the last tour leaves at 7:30. For advance tickets and more information visit hallockville.com. The Long Island Aquarium will hold it’s first ever Masquerade Ball on Oct. 30 from 8pm to midnight. Wear your favorite costume or bring a mask, but if you don’t, masks will be available for last-minute purchase. Tickets are $49.95 and include an open bar, Hors d’oeuvres, a light buffet, DJ and dancing. Call 631-208-9200, ext. 426 for more information and to make a reservation. Greenport Harbor Brewing Company on Main Road in Peconic will be throwing their Greenport “Horror” Brewery Party on Oct. 31. There will be a DJ and dancing, plus prizes for the best costume. Goodies will be served from the “haunted” food truck and admission is free. The party goes from 5pm to 10pm. For more information go to greenportharborbrewing.com. And finally for a unique North Fork fright visit Harbes Family Orchard on Sound Avenue in Riverhead. 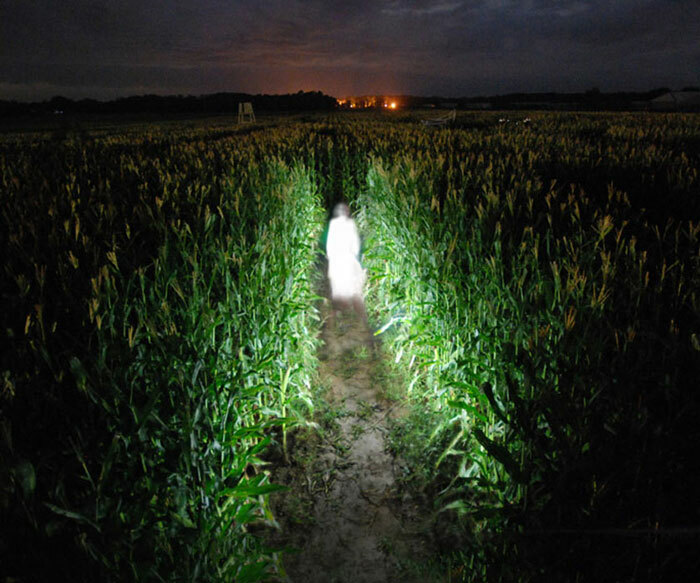 Experience a new level of maze adventure with the suspenseful Spooky Night Maze. Grab your flashlights, friends & courage and join them for a spooky night of fun at the Apple Orchard! Opens every Friday & Saturday night until 10/30. Of course your bed and breakfast hosts will be able to help you round out your weekend with world class restaurant recommendation as well as point you in the direction of the many North Fork wineries, farm stands and quaint boutiques and other weekend events.